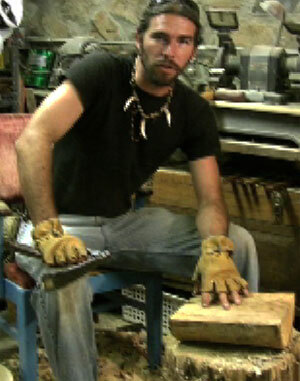 As you can see in these short videos, Justin is quite comfortable with adze work. He uses them aggressively to remove a lot of wood. Finishing up with gentle strokes to take fine shavings, he leaves the minimum amount to cleanup with knives. This does take practice. A novice shouldn't expect to achieve the same results right away. Gutter adzes are great for removing a lot of wood. The videos below show Justin using three of my adzes carving a bowl. I've tried to organize them so you can see how the three different adzes compare in use. In these first two videos, Justin is using one of my irons which he lashed onto his own handle. I highly recommend this as an economical way to get an adze. Each iron comes with very good instructions for hafting (mounting onto a handle) and plenty of seine twine for the lashing. 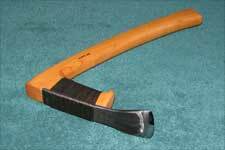 This is the adze I suggest getting as the least expensive way to begin hand hewn work. 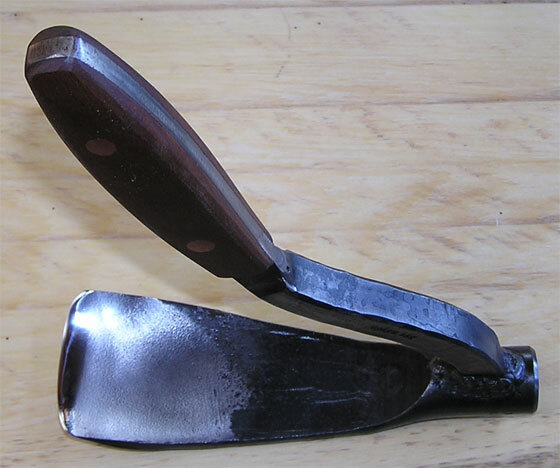 The Bowl Adze is the most aggressive, mostly because it is much heavier than the Elbow Gutter Adze. It was designed specifically for bowl making. This is the adze I recommend for the more serious carver who intends to carve a lot bowls. I make it in three different weights. In the next two videos, Justin shows that the Small Gutter Adze can also remove wood quite well. However, I discourage people from using it that aggressivley. To make deep cuts, what this adze lacks in weight must be made up for in speed. It's much more difficult to accurately control unwieldy strokes.